Surveillance image of a suspected Pizza Hut robber. 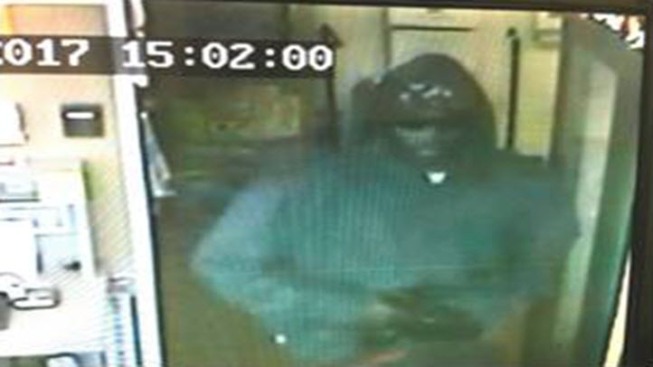 A pizza restaurant in Pinole was robbed Monday afternoon by a man pretending to have a gun, a police sergeant said. Police responded to a call from the Pizza Hut restaurant at 1211 Tara Hills Drive at around 4:20 p.m., Pinole police Sgt. Matt Avery said. The clerk at the restaurant told police a man had demanded money while his right hand was in a bag in a manner suggesting he had a firearm. The suspect ordered the clerk to lie on the ground, Avery said. The suspect told the clerk not to call police for at least 10 minutes after he left, Avery said. After taking money from the cash register, the suspect fled on foot, heading westbound on Tara Hills Drive. The suspect is a black man in his 20s or 30s with a goatee, possibly a beard, about six feet tall with a medium build, Avery said. He was wearing a dark black or gray hooded zip-up sweatshirt, white sneakers and dark blue or black jeans. Anyone with information is asked to call Pinole police at 510-724-8950.